The neon signs, the thrill of the hunt, the cackling laughter after securing the perfect item for your next craft project – garage sales are an emotional roller-coaster. Treasure hunters have different attitudes and strategies to scouring these urban flea markets. Find out what type of garage saler you are with our quick quiz. What phrase sounds most like you? Slam on your brakes, risking your life and the lives of those around you to make the turn. With change in your pocket and nothing better to do, you follow the signs to the sale. Skip that sign believing that another opportunity to catch a sale is just up the road. Park right in the driveway. You need to get in and get the good stuff before anyone else. Park a bit away and walk to the sale—you never know what bargain you will miss if you don’t stop in. Do a drive-by to see if anything catches your eye before deciding to park and shop. Always demand a lower price—you are here for the great deals. Ask about a deal but pay the asking price if it is reasonable and if you can dig out enough change from your car seats. Price is no object, you have found an item that is meant to be with you—it is fate. Before setting out for a day of garage sales, do you? Research each sale in the paper and on-line to decide which are the best sales then plan to get to the “best” sale at least 30 minutes early to poke around before others get there. Plan on hitting the sales that will still be open once you have had breakfast (or lunch). After all, the best deals can be found at the end of the day. No need for a plan, you will be drawn to the sale that will have what you want. This is serious business, there are treasures out there and, by golly, you are going to be the one to find them. Once you have found them, you are going to drive a hard bargain and people are gonna like it. Once you have bought that perfect treasure, you know just the right places to sell it like etsy.com, sell.com, ebay.com. You found gsalr.com before anyone else and you use it like a finely crafted tool of your trade. 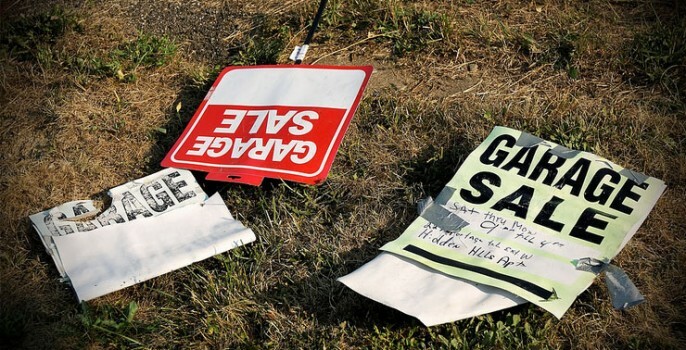 Garage sales are a fun pastime for you but you don’t let that get in the way of all your other pastimes like sleeping, eating, playing outside, etc. You may have a list of things to look for during the garage sale season in your head but you are not going to spend a ton of time trying to figure out exactly where to find them. Your philosophy is to get there late and get the good bargains. You are able to negotiate prices down by reminding people that they are going to need to do something with all their unsold items—why not sell them for cheap (to you). Your house and garage get a bit fuller each year, but that is o.k., you can have your own sale next year and sell off some of those found goodies. There are items out there that you want, but you just don’t know it yet. You will peruse casually, knowing that the stars will align and you will be paired with the item you always wanted but didn’t know you had to have until you hit that packed lawn on a Saturday. Each item you collect at a sale has a story. You tell your friends how you came to meet your fateful favor. All your tokens find just the right nook in your home or on your property. Cover image by Mark Turnauckas on Flickr. Hey! Writing an article to promote a yard sale the Rotary clubs are doing to make $$ for the Discovery Center. I googled Yard Sale Personalities–and your test came up. May I put a link to this in my article–It will be published in a local ‘Family Times’ magazine that advertises our activities.